WITH A TOTAL LENGTH of 820 mi (1,320 km) flowing through SWITZERLAND, GERMANY, and the NETHERLANDS, the Rhine is the longest river in Germany and probably the most important waterway of western Europe. The Vorderhein, Hinterrhein, and Alpenrhein are the sources of the river within Switzerland. The Rhine then enters the Bodensee (Lake Constance) and reemerges as the Hochrhein up to Basel on the Swiss-German border. From Basel, it passes as the Oberrhein on the French-German border via Strasbourg/Kehl into Germany to the cities of Carlsruhe, Mannheim/Ludwigshafen, and Mainz. 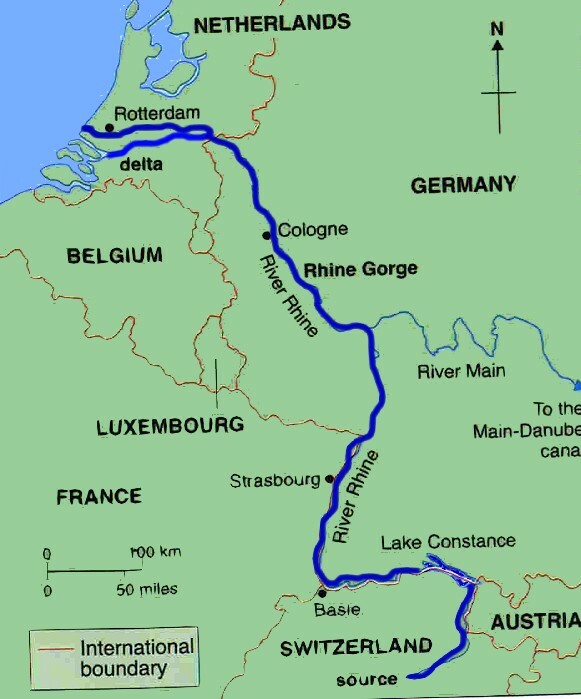 After Mainz, it becomes the Mittelrhein and Niederrhein and goes on via Bonn, Cologne, Duesseldorf, and Duisburg to the German-Dutch border. It terminates its route via Nijmegen at Rotterdam, the Netherlands, on the North Sea. Flowing roughly northwest, the Rhine’s annual flow at its mouth is 16.6 cubic mi (69.3 cubic km). The river is of enormous economic, cultural, and historical importance for all of western Europe. The Romans came to the Rhine and tried to colonize parts of Germania by crossing the river, but it was in the early Middle Ages, when the new empire of Charles the Great consisted of large territories on both sides of the Rhine. These territories now form—at least in parts—FRANCE, Germany, Switzerland, AUSTRIA, BELGIUM, LUXEMBOURG, and the Netherlands. When the empire broke up after the death of Charles, two succession regions (what is today France and Germany) engaged in longstanding disputes, whereby the Rhine was a symbol as well as a catalyst. The concept of natural borders developed under the French King Louis XIV embraced all the left (western) side of the Rhine as the French border. This strategic goal was not reached until the military successes of Napoleon Bonaparte. The French always hoped for a confederation of smaller German states on the right (eastern) side of the Rhine allied with France, which they tried to install in the early 1800s and again after 1918. These attempts failed, and since the early 19th century, German nationalism claimed the Rhine not as a border, but as an integral part of Germany on both sides of the river. German nationalists tried to establish this concept by force and with catastrophic consequences in 1870–71, 1914–18, and 1939–45. After more than 200 years of wars concerning the rule over the Rhine, this dispute was finally settled by the outcome of World War II and by the French-German friendship treaty signed by French President Charles de Gaulle and German Chancellor Konrad Adenauer in 1963. The economic importance of the Rhine is mostly due to its role as a waterway crossing large parts of western Europe (with canals to French rivers and to the German Main and DANUBE). Due to the engineering work started by Johann Gottfried Tulla in the Grand-Duchy of Baden in the early 19th century, the Rhine is today accessible for ships from Basel via Strasbourg through all of Germany to Rotterdam and the North Sea. The economic importance led to international treaties, which were all signed in Mannheim (especially in 1831 and 1868). This waterway helped the development of all sorts of industry along the Rhine (for example: chemical industry in Basel, Strasbourg, Mannheim and Ludwigshafen; steel and coal in the parts of the Rhine near the Ruhr area). The ports of Strasbourg, Mannheim, and Duisburg are important river ports within western Europe, and the port of Rotterdam is the busiest harbor worldwide. During the last decades, environmental protection of the Rhine both for animals (especially birds and fish) and for the prevention of floods (Rheinauen) has become a subject of international efforts and treaties. As a historically disputed frontier, the banks of the Rhine have a great number of fortresses, especially between Mainz and Bonn in Germany. Though mostly ruins now, these structures witnessed the importance of the Rhine as a melting pot for cultural and economic traditions for more than 1,000 years. Today, the ruins, along with notable vineyards, contribute to the tourism industry. The battles of the Allied forces during World War II against Nazi Germany in the Rhine region (especially Arnheim) have contributed to the unfortunately bloody heritage of the Rhine.